Since November I have cooked curry about 20 times, before that I have never cooked curry or even care to eat it. I know plenty of people who enjoy eating Thai curry made with coconut milk, hot Indian curry, or Japanese saucy curry. I, however, never really develop a taste for curries; I guess we all have a kryptonite. So what happened last November that changed my mind about curry? I tasted the best curry at Thanksgiving dinner, made by my boyfriend's aunt. She used to be a cook for a living, and he raves about a cooking all the time. I was very skeptic at first, but he said ca ri ga was one of her best dish! To my surprise her curry was delicious! It had a lot of curry flavor and the right kick of spiciness. I didn't taste any coconut milk but I can tell a little bit of milk was use. If only I tasted her curry first, my feeling for curries may not be same as before. I spent the last 6 months trying to re-create that curry, bless my family and boyfriend for eating so much curry and being my guinea pig. I made curry so many times I can probably make it in my sleep. But I don't regret any of it, actually learned a lot through trial and error. For optimal flavor, I suggest marinading your chicken over night. 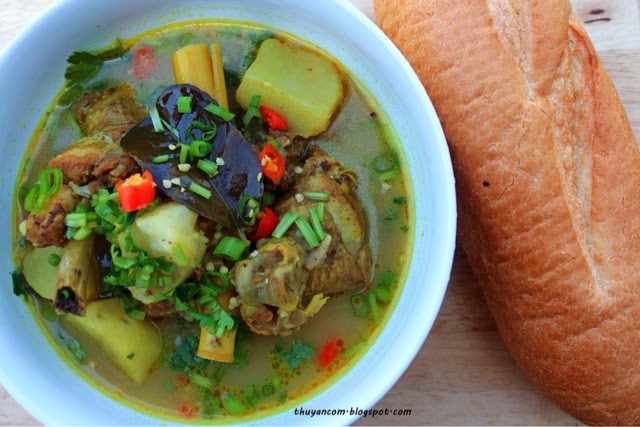 To achieve curry flavor in your broth, you'll need to cook curry powder into your broth similar to the way you would make Bun Bo Hue. If you choose to use milk, you should add your milk a little at a time on very low heat. I find it best to add milk at the very end. This curry does not have that rich flavor from the coconut milk. It's not as saucy because I prefer it to be like a broth so you can eat it with noodles or bread. If you like it more saucy, I would use less water. This curry is more savory, with a kick of chili in every bite. You'll definitely be sweating when eating curry at my house. Enjoy! 1. Marinade chicken with 3 tablespoon of cooking oil, 1 teaspoon of salt, 4 tablespoon of fish sauce, 1 tablespoon of sugar, 1 tablespoon of mushroom seasoning, 1/2 a bag of curry powder (about 3 tablespoon), minced garlic, minced shallots, and minced lemongrass. Marinade overnight if possible. 2. Peel the potatoes and cut into cubes, soak in water until ready to use. 3. In a pot, brown the marinaded chicken. Does not need to be cooked all the way. 4. Add the coconut juice and chicken broth. Let chicken simmer in this mixture for about 10 minutes. If you want the curry to be saucy then you can go ahead and the lemongrass stalk,ginger, and bay leaf. Season the broth with salt and sugar. 5. In a pan add 2 tablespoon of cooking oil on very low heat. Add the other half of the curry powder and cook into the oil. Add this mixture to the broth. 5. If you want more of soup broth, then you'll want to add more water as if you are making a noodle soup. Season the broth with salt and sugar to your liking. Let everything marry in the pot for another 20 minutes. 6. Add the potatoes at the very end because they will cook very fast. Just before the curry is done add about 1 cup of milk a little bit at a time on very low heat, mixing it into the broth. Turn off the heat. 7. Curry can be eating noodle, bread, or rice. Garnish with some green onions and cilantro. Enjoy! yummy! That is a curry to crave - it looks so comforting and delicious! I like how you use the whole chicken, too. Do you have any idea what someone could use instead of that kind of curry powder, in case they can't find it? I'm so glad you are posting recipes again! I love your recipes! You can use masala curry powder. I bought a bag of masala curry powder at my local Indian grocery store and been meaning to try it out. It has the same spices and ingredients with the one I buy at the Viet stores. hi, is the directions incomplete because I cant find instructions on the rest of the ingredients like bay leaf or onion powder. I wish I had read more carefully through. but will try it to complete it anyhow. Sorry about that, I updating a lot of my recipes back and forth on my ipad amd computer and sometimes it doesmt save correctly on the ipad. Should be up to date now. about it, now i am going to cook at home with the help of your blog. Thank you..